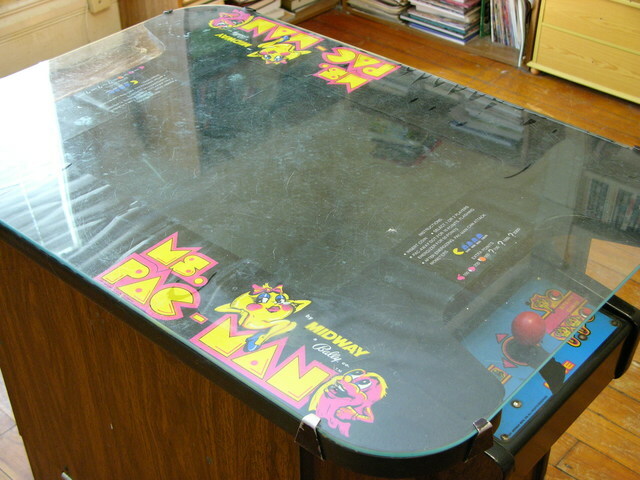 A month ago I added a Ms Pac-Man cocktail table to my arcade game collection. 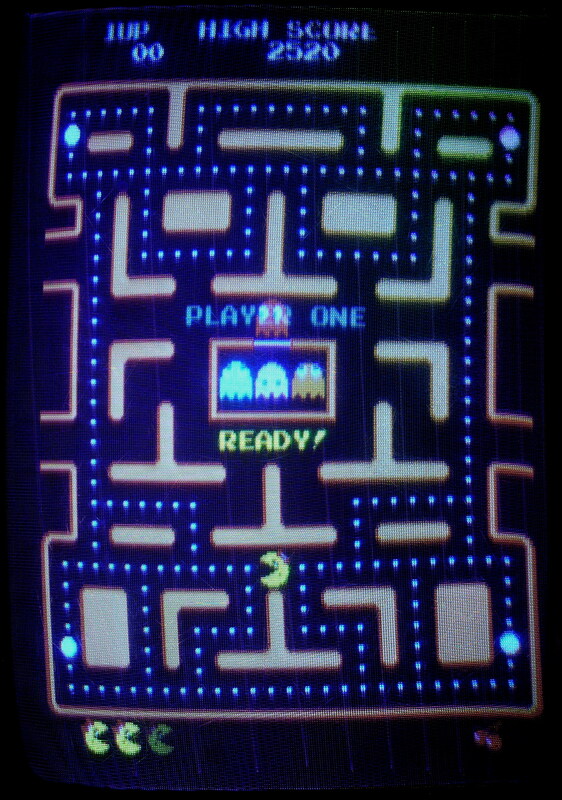 I don’t even like Pac-Man games; but I’ve always figured I should have one, and this was the right opportunity. The eBay seller was right here in my hometown, saving me considerable freight and/or transportation expenses, so the $400 final bid wasn’t too painful. Seeing games in person that I’ve purchased on eBay is always an . . . experience. 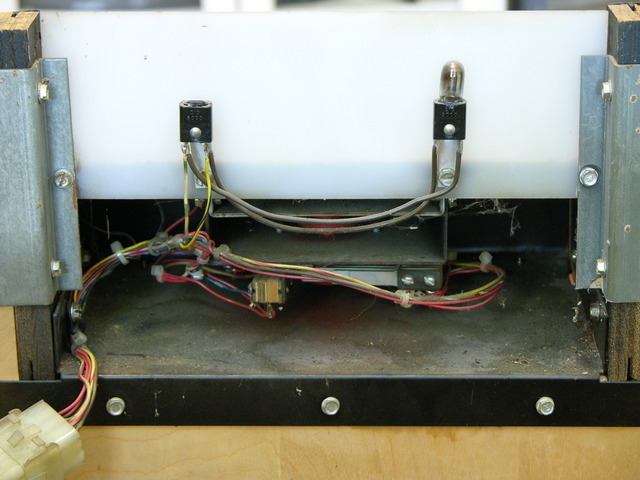 From the seller’s pictures, I would have rated this about a 4/5 on my personal scale — no cabinet or artwork damage, everything works, but maybe some grime on the control panel and some burn-in on the monitor. After picking it up, it was obvious that it was more like a 3/5, again on my personal scale. It was nothing the seller was concealing deliberately — he’s obviously not a collector and just didn’t know any better. I’m not upset about it; it’s all reparable, I’m used to it, and I still feel I got a fair deal. It just means it’s going to take a little work. Here are the things that immediately caught my attention. 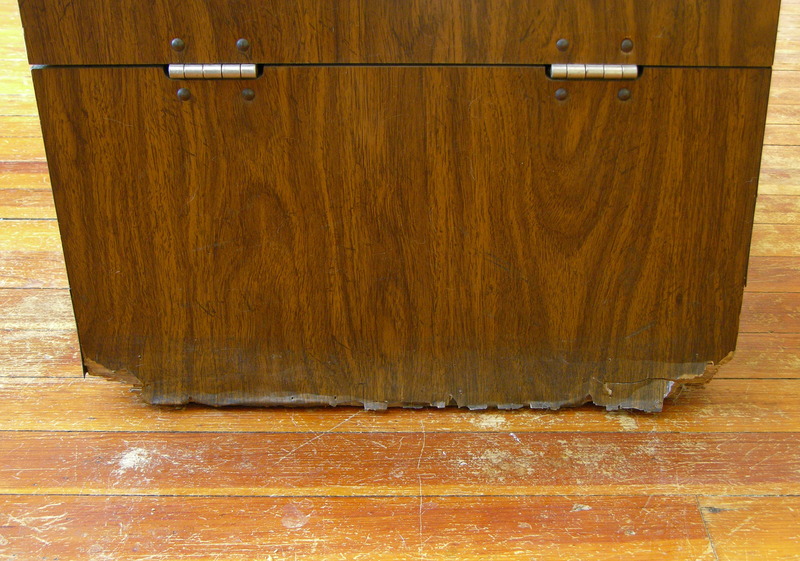 The plywood at the bottom of the back side of the cabinet has considerable water damage. 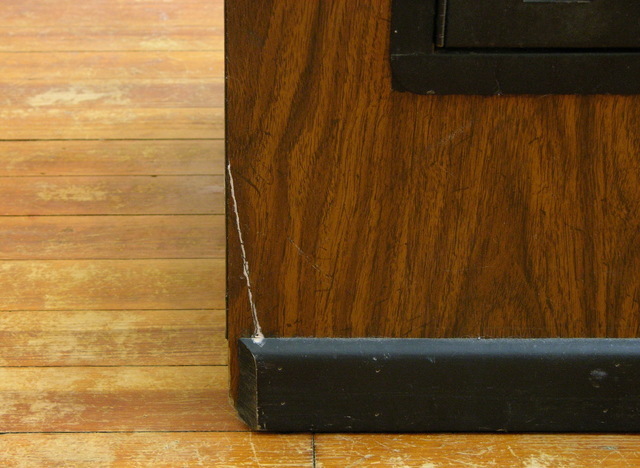 There’s a large scratch near the bottom of the front side of the cabinet. It looks fresh — I think the seller did it wheeling the game sideways out of his basement on a strapless (non-appliance) dolly, after I specifically told him on the phone that I wanted to carry the game out of the basement by hand with my brother. 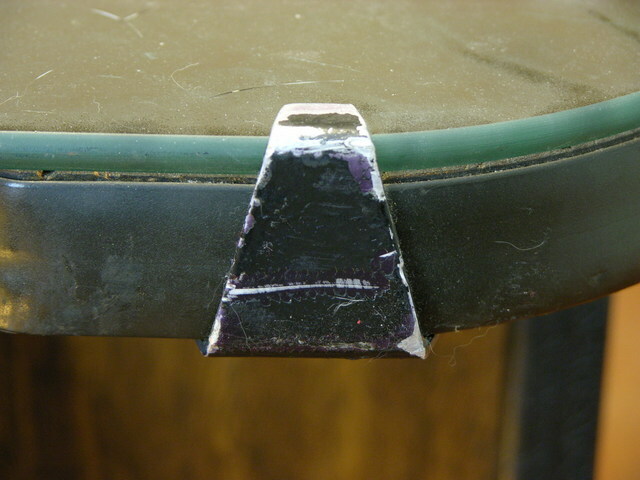 One of the leveling feet is missing. The tabletop glass is filthy, apparently on both sides, even before I got it home and the cats started sitting on it. The clips holding down the tabletop glass are mismatched and the paint is worn off of many of them. The tabletop overlay is seriously wrinkled. Around the edges where it overhangs the player controls (! ), I can’t feel any adhesive on it at all. It looks to me like a cheap repro that just sets in place. The lights behind the translucent panels that illuminate the player controls aren’t illuminating. One is missing and the other three are apparently all burned out. 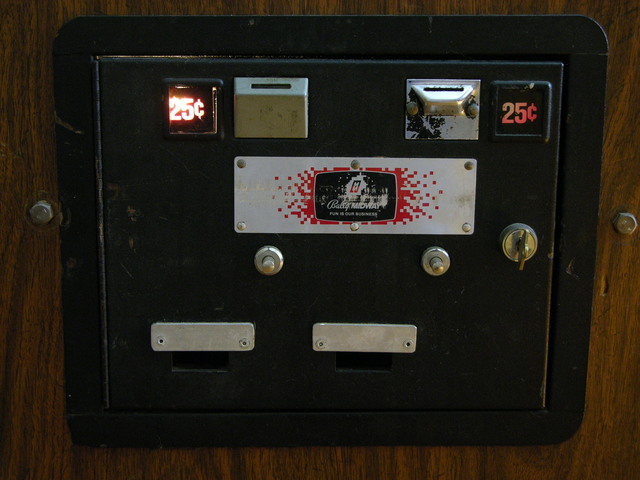 One of the coin door lights is burned out. 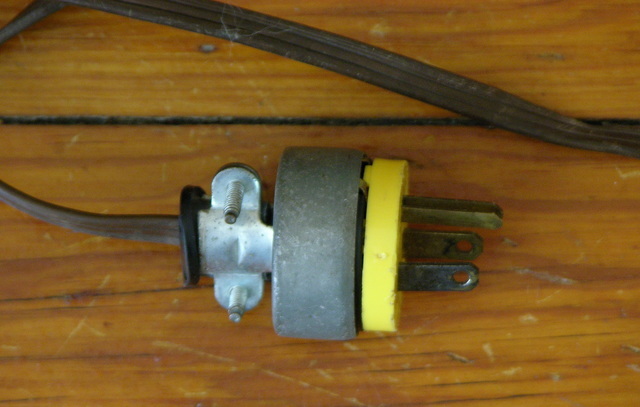 The power cord and plug are obviously not original. Yeccch. 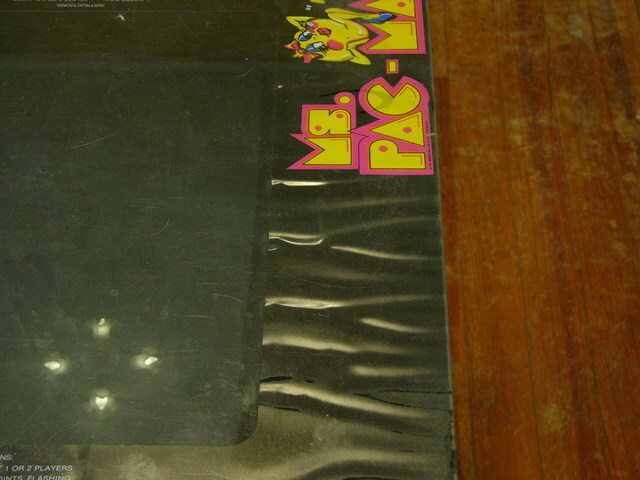 The game has the “speed chip” that makes Ms Pac-Man move way too fast. I prefer my games to be in original condition with default configurations. The monitor is dim and has the brightness turned up high enough to see the vertical retrace and to see the black background glowing. All in all, it’s going to take a little bit of work to get this back to nice condition, much less truly tip-top (which is impossible with the water damage on a veneered cabinet). 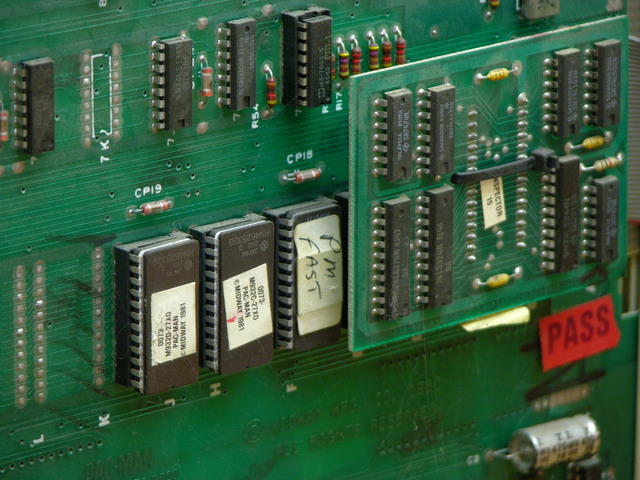 I’ve started already by finding a ROM image for the original chip that the speed chip replaced, and some 2532 EPROMs to put it on. Turns out I had 2516s, 2732s, and all manner of other 27xx EPROMs, but no 2532s. And don’t ask me why, but I didn’t feel like erasing and overwriting the speed chip. 2500 and 2700 EPROMs aren’t pin-compatible and I really didn’t want to build a carrier board. Fortunately I packed up a batch of allegedly-new 2532s on eBay, got Joel to burn my new ROM for me . . . and lost where I put it already. Oy vey. 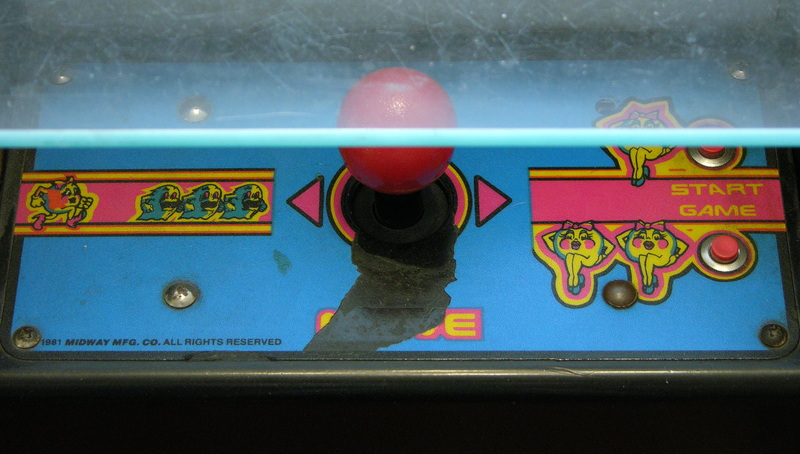 You are currently browsing the archives for the Arcade category.